New Delhi, Dr. Aparna Hegde from ARMMAN Mumbai, Dr. Avi Kumar Bansal from National JALMA Institute for Leprosy and Other Mycobacterial Diseases Agra and Dr. Omesh Kumar Bharti from State Institute of Health & Family Welfare, Govt of Himachal Pradesh. 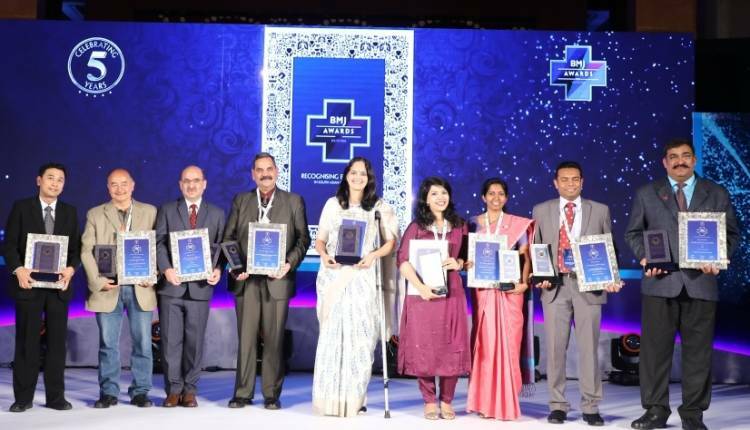 British Medical Journal (BMJ) India organized the 5th edition of the BMJ Awards South Asia 2018 on December 1 at Hilton Chennai. The top healthcare dignitaries in the country attended the award ceremony. The esteemed panel of jury members consisted of eminent thought leaders, senior experienced doctors, and industry veterans from various healthcare organizations. This year too, nominations were invited from the South Asian region, including India, Myanmar, Sri Lanka, Bangladesh, Pakistan, Maldives, Afghanistan, Bangladesh and Nepal in numerous categories like healthcare quality, medical education, healthcare innovation, and research. More than 1500 nominations were received for the Awards from across South Asia and were shortlisted to 30 nominations across 10 categories. Winners were presented with a trophy and a certificate in the presence of India’s most senior healthcare professionals, industry executives, government officials, academicians, and researchers. The Chief Guest for the Award ceremony was Dr. V.K. Paul, Member Niti Aayog, who addressed the audience and gave away an Award providing encouragement to the winners and finalists alike. Following are the winners of the prestigious 5th BMJ South Asia Awards 2018. The BMJ Awards are conferred after a rigorous and thorough evaluation process and are awarded to commend those who have accomplished the most impactful healthcare work in South Asia.